Hydro Crunch T5 2x4 Fluorescents are built with 95% reflective aluminum interior to maximize light intensity and distribution and is perfect for the vegetative growth period of your plants. 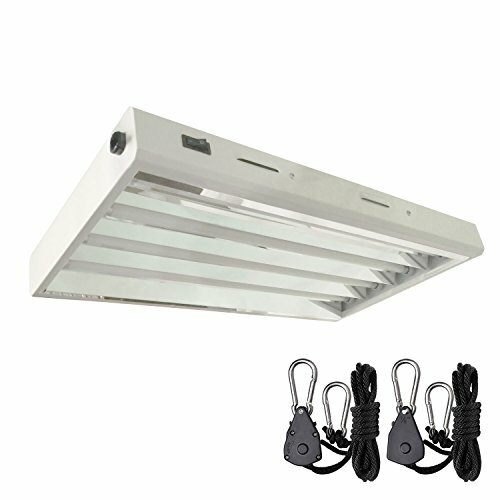 This fixture can be hung horizontally or vertically, 4 x 6400K HO bulbs included, slotted housing for optimal cooling, runs on 120-Volt. Propagate your seedlings effectively with a high output fluorescent light made for plant propagation. 8,000 total Lumen in the blue spectrum is perfect for propagating seedlings, clones, or keeping plants happy year round. At 2,000-Lumen and 24-Watt per bulb, the high output T-5 boasts itself as the strongest fluorescent lighting around. Includes a FREE pair of rope hangers. Dimensions: 23.25" x 13" x 2.4"